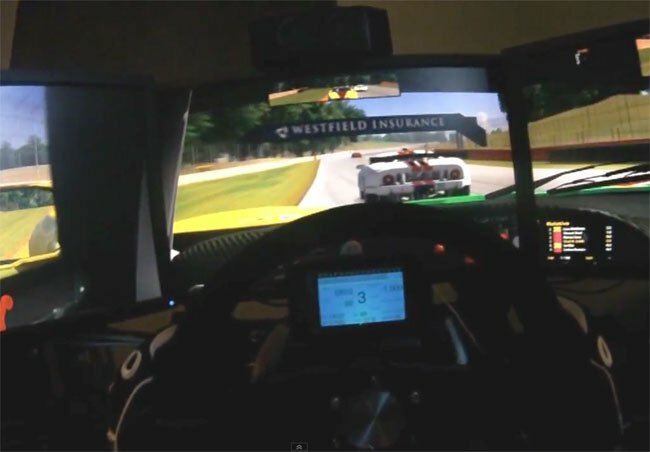 If you enjoy a good racing game you are sure to be delighted by this 5 screen racing rig simulator that has been built by Chad Smith in his home. The video after the jump show the rig playing the popular iRacing multiplayer game. The 5 screens provide a massive 9600×1080 resolution, using a AMD Radeon HD 6870 graphics card to provide around 84 frames-per-second whilst playing. Unfortunately the camera doesn’t have a wide enough lens to be able to capture all 5 screens and the action in the shot. Smith has also used the iRaceDash app for iOS on an iPhone, which he has fixed to his force-feedback steering wheel. The $5 application provides real-time data on his car’s performance, including speed, fuel level, and tire condition to add to the overall immersive effect of the gaming rig.